aka ‘The Nun of Kenmare’. ‘Well, I never knew how good I was ’till now’, Dominick Beirne was quoted as saying on the evening of 21 August 1879. Beirne and at least fourteen of his friends and relations had just witnessed what they reported as an apparition of the Virgin Mary, Saint Joseph and Saint John the Evangelist by the south gable of their parish chapel in Knock, County Mayo. For nearly two hours a group that fluctuated between two and perhaps as many as twenty-five stood or knelt gazing at the figures as rain lashed them in the gathering darkness. Beirne’s statement, although perhaps apocryphal, is more than a quaint bit of innocence written to make the reader smile. As word of Knock spread across the Irish world, writers and proponents of the developing cult of Our Lady of Knock took Beirne’s assessment as to why the Virgin came to Knock and applied it to the Irish nation as a whole. She came to Ireland in order that the Irish people might know that they were good and had found favour with God. As silent visions continued at Knock throughout the next three years, it was determined that Mary was appearing at Knock for the benefit of the entire Irish nation rather than as a sign of favour to any one person or group. As the series of visions was silent, the Irish people were provided with a blank slate upon which they could compose their own message from heaven. Historians and devotional writers who have sought to understand Knock have also had to deal with a certain silence. Most of the documents from the early years at Knock were assumed to have been lost. In 1936, when, Archbishop Gilmartin of Tuam, reopened the investigation into the events of 1879, investigators were forced to rely upon interviews with the last of the living witnesses, their children, and press reports and devotional works printed in the 1880s, which portrayed the developing cult in a positive light. As Knock occurred at the beginning of the Land War, and in the same area, many devotional writers were careful not to make explicit connections between the pilgrimage and the land movement. In their desire to see the pilgrimage approved by the then Archbishop of Tuam, John McEvilly, they thought it best to keep political messages away from the visions. The archbishop had a reputation for being ambivalent about the agitation, and he was known to be in the episcopal camp of Edward Cardinal McCabe of Dublin, who was openly hostile to the agitation. What is perhaps more significant than the lack of explicit statements linking the Virgin with the Land League is the failure of anyone to insert anti-Land League rhetoric into the mouth of the Virgin. I was always intrigued by the coincidence of Knock with the Land War, but, like most writers interested in the topic, the lack of sources meant that I had to work with printed materials. In the summer of 1995, while doing research in Washington, DC among the papers of Margaret Anna Cusack (Sister Mary Francis Clare), foundress of the Sisters of St Joseph of Peace, I enquired about the contents of a large box marked ‘pre-foundation papers’. As the purpose of the archive is to facilitate research into the development and the history of the order, with the foundation of the order being the principal event around which the archive is organised, I was told that the box did not really contain much of interest, but that I was welcome to take a look if I wanted to. Upon opening the box, I had some small sense of what it might feel like to find a chalice in a bog or a Caravaggio on Great Denmark Street. The box contained the original, unedited depositions of several of the 21 August 1879 witnesses, the original manuscript of the parish priest’s account of cures, depositions and statements taken from witnesses in 1880, and hundreds of other documents and letters from people seeking or claiming cures through the intercession of Our Lady of Knock. These records promise to challenge our present understanding of Knock, the relationship between religion and nationalism in nineteenth century Ireland, and the progress of the Devotional Revolution in creating the Irish Catholicism of the twentieth century. investigation into the events of 1879. Scholars have sought to explain the visions at Knock as a reaction to the modernising effect of the land war. Some see Knock as a conservative social movement supported by the clergy as an alternative to the Land League, while others claim that Knock draws on an older tradition of millenarian peasant prophecy. In light of the documents found among the Cusack papers, neither of these theories is satisfactory. Knock was not a rearguard reaction against the forces of modernity: it was itself a force and a manifestation of modernity. The Land League and the pilgrimage developed in parallel and simultaneous ways, involving many of the same characters, and utilising similar techniques of popularisation and propagation. Both movements began in Mayo but quickly succumbed to control from outside as they became part of a larger, international Irish world that was bringing a new social, economic, and religious culture to Mayo. Writers like T.D. Sullivan of The Nation, John McPhilpin of the Tuam News, which first broke the Knock story in January 1880, and the ‘Nun of Kenmare’, as the devotional writer Sister Mary Francis Clare Cusack was known, all avoided making explicit reference to the land agitation in their writings about Knock. Yet Sullivan and McPhilpin found themselves in prison during the Land War, and Cusack made her way from Kenmare to Knock in 1881 after receiving death threats upon publication of her book outlining the abuse of tenants on the Landsdowne and Kenmare estates in Kerry. Andrew Higgins, who developed a profound dislike for Cusack while he was parish priest in Kenmare, was the government choice to fill the Kerry see precisely because of his opposition to the tenants’ cause. Sister Mary Francis Clare quit Kerry less than a week after Higgins was named bishop. While she denied any official connection to the Land League, the ‘Nun of Kenmare’s Relief Fund’ collected over £20,000 in 1880, distributing large sums through local Land League branches. The popular perception that the Nun was a member of the Land League was so pervasive that Tobias Kirby, Rector of the Irish College in Rome, wrote to Archbishop Thomas Croke of Cashel late in 1881 saying that the Nun would be able to collect large sums for Knock as she was President of the Ladies’ Land League. The press played a critical role in the land and Knock movements. As the land agitation grew and spread, the press was the most influential factor in disseminating Land League ideology. Reports from Ireland were picked up by the emigrant press and published in the Irish World of New York or the Boston Pilot. The active involvement of the American Irish press meant that the ideas, aspirations and the experience of the Irish living abroad would help determine the outlook of Mayo peasants and would shape events in Ireland during the land war. Similarly, the pilgrimage and message of Knock came to represent ideas originating far from Mayo. As reporters came to Knock beginning in 1880, stories from Knock found their way into papers all over the Irish world. Archdeacon Cavanagh, the parish priest at Knock, sent bits of plaster from the gable of the church to every land where English was spoken and then saw to the publication of cures wrought by the plaster. As people from an ever widening circle had recourse to Knock, events there were increasingly interpreted as being of national rather than local significance. This meant that Knock would not primarily represent the interests of the locality but those of the Irish everywhere. Even if there were connections in the minds of Mayo villagers between the visions and earlier millenarian tradition, the public image, interpretation, and message of Knock was composed by people living abroad or in Irish cities, whose world view and contextual framework was much broader than that of rural Mayo. The Cusack papers show how many figures from moderate nationalists to Land Leaguers and Fenians were actively involved with Knock. We find requests for prayers and favours and letters that contained donations from local Land League branches in British cities and on the American frontier, from Irishmen serving in the British army throughout the empire, and from such figures as James Redpath of the New York Tribune, a Protestant and a major American proponent of the Land League. Redpath and New York’s Tammany Hall boss ‘Honest John’ Kelly raised thousands of dollars for the Nun of Kenmare at Knock by giving lectures in New York. Cusack also enlisted support from prominent figures in the church whose sympathy was known to lie with nationalists or with the Land League. Archbishop Croke was a regular supporter of Knock and Cusack, donating relics for the altar stone in the convent and protecting the Nun from her detractors among the Irish episcopacy. She also had the support of Edward Cardinal Manning of Westminster and Bishop Bagshawe of Nottingham, who often displayed sympathy for Irish causes. An open air Mass at the shrine c.1880. Note the rows of crutches abandoned by disabled people who believed themselves cured and the extent to which the wall has been denuded of plaster by pilgrims eager for relics. Knock was also given support by Mayo priests active in the Land League. Canons Waldron of Ballyhaunis and Corbett of Claremorris assisted the Archbishop of Tuam’s commission to investigate Knock. They were among the first Mayo priests to support the tenants’ agitation. The ‘Godfather of Mayo politics’, Canon Ulick Bourke of Claremorris, was also on the commission. While Bourke may have had some difficulty sharing the social leadership of Mayo with some of the lay leaders of the Land League, there is little doubt about his nationalist credentials. As president of St Jarlath’s College, Tuam, he had a reputation as a Fenian fellow traveller. A member of the Royal Irish Academy and the author of several philological works on the Irish language, Bourke was one of the leading lights of the early language revival. John McPhilpin of the Tuam News was his nephew, and the paper was considered to reflect Bourke’s personal views. Accustomed to thinking nationally, Canon Bourke joined T.D. Sullivan and the Nun of Kenmare in developing Knock as a national Marian pilgrimage. Other priests associated with the Fenian movement often led organised pilgrimages to Knock. We find Canon Monahan, a close advisor of Bishop Bagshawe of Nottingham, claiming to have seen visions at Knock in 1880. The beloved former prior of the Augustinian convent at Ballyhaunis, James Anderson, recently transferred to Drogheda, led a group of pilgrims from there to Knock in 1880. Fr. Quick, the confessor to the Manchester Martyrs, was allegedly healed of a hand ailment while leading a group of Lancashire pilgrims that same year. The second meeting of the land agitation was held at Knock on 1 June 1879 to protest a sermon by Archdeacon Cavanagh in which he condemned local Fenians who were instrumental in the 15 April Irishtown meeting considered to be the birth of the land war. The principal Fenians involved in the Knock protest were John O’Kane and P.J. Gordon of Claremorris. Gordon later appeared on nearly every Land League platform in Galway and Mayo, and was arrested with Parnell, Davitt, T.D. Sullivan, and other leaders of the League in 1880. Gordon was not a tenant farmer by occupation but was a cobbler and shoemaker in Claremorris. As the pilgrimage grew, Gordon saw to the quite profitable operation of outside cars between the railway station at Claremorris and Knock, about five miles distant. By August, 1880, the number of outside cars in the town had increased from five to over fifty. This nineteenth century engraving by the artist Karl Ulhemann captures something of the excitment in the village as the news spread. Gordon had an even more vital connection to Knock than his business interest. His twelve year old daughter Delia was subject to violent pain in her left ear. Ten days after the 21 August apparition, Gordon’s wife and daughter were at Mass at Knock. At the elevation, Delia screamed as the pain became intolerable. Hurrying the girl outside the church to the spot where Mary had appeared, Mrs Gordon picked or scraped a bit of plaster from the gable wall, and after making the sign of the cross over her daughter with the fragment, touched it to the child’s afflicted ear. The cure, the first at Knock, was instantaneous. Delia’s cure was given tremendous publicity by T.D. Sullivan in 1880, and thus was born the belief that the plaster had a powerful thaumaturgic effect. The development of the pilgrimage to Knock is part of that same incursion of modern life into rural Connacht as the railroad, which came to Claremorris and Ballyhaunis in 1862, the same year that the Royal Irish Constabulary opened its Knock barracks. Archdeacon Cavanagh saw to the creation of eleven national schools in the combined parishes of Knock and Aghamore between 1867 and 1883, and the Nun of Kenmare opened a kindergarten for infants, national schools for boys and girls, and a school to teach industrial and domestic skills to girls bound for emigration, another fact of modern life in Mayo. It was necessary for Cavanagh to preach in English and Irish each Sunday as the schools saw to the replacement of Irish with English as the language of the young. This linguistic crisis may be connected with the silence of the Knock visions, as the oldest witness, Bridget Trench, had no English, while the youngest, six year old John Curry, was being educated with no Irish. The triumph of this cultural shift can be seen in the way that Canon Bourke directed the curious not to the villagers who witnessed the 21 August visions but to subconstables Fraher and Collins of the RIC, who saw lights on the gable on 5 January 1880, and to the national school teacher Miss Anderson, who saw an eighteen-inch high Virgin that same evening. Canon Bourke characterised one of the policemen as a ‘witness worth hearing’, thus reinforcing the power, prestige, and authority of these figures of cultural change. The theory that Knock was a modern and national phenomenon is also borne out by the way in which clergy, devotional writers, and pilgrims sought to pattern Knock on the Lourdes pilgrimage. The original press account in Canon Bourke’s Tuam News described how the west of Ireland was the ‘trysting place’ of all who sought to improve small farmers’ positions, the flames from which were embracing all four provinces. Similarly, the west presented another attraction, a ‘second Lourdes’, attracting not only the Irish but Catholics from Europe and America. References to Knock as another Lourdes continued to appear in press reports and pilgrims’ accounts throughout the eighties. In associating Knock with Lourdes, and by seeing Knock as an international phenomenon, writers and pilgrims were making a clear statement about a shift in Irish piety. Lourdes is a modern, national pilgrimage through which the French nation expresses its solidarity and its desire to have the Virgin as patroness. It differs from a local pilgrimage in significant ways. Nearly every parish or village in Ireland has a local pilgrimage, usually a well or a site associated with an Irish saint. These pilgrimages seek to create or reinforce local solidarity. Ancient national pilgrimages like Croagh Patrick and Lough Derg continued to draw well throughout the nineteenth century, but these are essentially ascetic or penitential in nature. The Knock pilgrimage combined traditional Irish practices like rounds of the church and all night vigils with neo-Tridentine devotions like stations of the cross, benediction, and processions with the pageantry of coloured torches, silken banners, and the recitation or singing of long litanies. Brought to Knock by urban pilgrims who came as members of sodalities and confraternities, these devotions clearly impressed the local clergy who incorporated them into the pilgrimage on a regular basis. By May 1880 the parish’s national school teachers had introduced the Children of Mary as a regular part of the pilgrims’ procession, with their matching dresses and veils adorned with flowers. The teachers had also organised the young men of the parish to act as guides, and had even developed a fifty-voice choir. The focal point of the pilgrimage was confession and the reception of the Eucharist. In August 1880 three priests sat beneath umbrellas in the rain while crowds gathered around them seeking to be shriven, while later that same month a woman who was watching the eyes of the Virgin’s statue move left the statue because it was her turn to go to confession. The prioritisation of spiritual values evidenced by the central role of confession and communion in the pilgrimage was not only appealing to the clergy but also ensured that despite the continuing reports of visions, the pilgrimage would ultimately be controlled by the clergy. The devotional examples set by organised pilgrimages had an impact on local piety similar to that which policemen and schoolteachers had on social relations. The regular contact between urban and rural people furthered the progress and consolidation of what has come to be called the Devotional Revolution, that process by which continental European devotions became the standard spiritual fare of Ireland’s Catholic population. Seeing the laity making frequent and regular approaches to the sacraments and seeing the pilgrimage as a vehicle to consolidate and regularise devotional practise encouraged the clergy to validate the developing cult and pilgrimage. 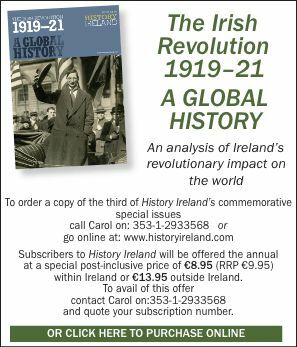 The silent visions were interpreted as either confirming the Irish in their present practise of Catholicism or as the Virgin’s offer of succour and support in the struggle against disasters occasioned upon the Irish by Britain. One pilgrim wrote how the apparitions were a result of God’s love for the poor, who are His first care. He adds, ‘We wish the English government could learn this lesson in reference to Ireland, where the poor have been by them the least, instead of the first considered’. The Nun of Kenmare often compared Knock with Lourdes and Lasallette, where Mary is seen tempering God’s justice by holding back Christ’s hand raised in punishment. Unlike France, where national Marian pilgrimages were offered as reparation for the sins of the nation, there was no sense of national sinfulness connected with Knock. Although Ireland was a nation of sinners, it was not a sinful nation, and the Irish were being rewarded for their faithfulness, while the French, Cusack wrote, had failed in this regard, ‘Perhaps if Catholics in France had received the favour which the Mother of God bestowed on them at Lourdes with more faith and fervour and thought more of God’s grace and love, then France would not be as it is today’. Our Lady of Knock by Currier and lves. The Cusack papers can also help us to understand why Knock failed to continue developing after 1883. Sister M.F. Clare considered herself a latter day Catherine of Sienna, and she quickly lost patience with Archbishop McEvilly’s failure to take her counsel. She believed that as a vessel through which God communicated His will, she should be allowed to go to Rome to communicate her intimate messages to the Holy Father. By his refusal to assent to her wishes, McEvilly was seen by Cusack as a sinful, erring bishop who was persecuting a saintly woman and interfering with God’s desires. Leaving Knock late in 1883, Cusack took not only most of Knock’s documents but also the money subscribed to build a convent there. This caused an international scandal and gave Knock a tainted reputation from which it took over fifty years to recover. The Nun of Kenmare never recovered from the wounds she thought were inflicted upon her at Knock, as rumours and innuendo about her departure from Knock followed her to America, where they contributed to her eventual apostasy from Roman Catholicism. Without the capital needed to build comfortable accommodations for middle class pilgrims, Knock withered until Dr. Gilmartin and Dr. Walsh expressed interest in the 1930s and ‘40s. Material comforts began to be provided for pilgrims, culminating in the new basilica and the airport. The fact that pilgrims in 1883 saw taking the train to Mayo as a sufficient move outside of life’s routine to satisfy the desire for liminality which is at the heart of the pilgrimage experience is itself evidence of an increasingly modern mentality. Ironically, it was the ultimate triumph of middle class values and the Devotional Revolution that led to the decline of the pilgrimage, as the pilgrimage failed to stay the pace that it had helped to set. The apparitions at Knock are certainly related to the excitement generated by agrarian distress, the land agitation, and the steady incursion of the modern world into Connacht. The Cusack papers promise to show that the Land League and the pilgrimage were not alternative movements developing in opposition to each other. They are, in fact, complementary movements, and Knock presented Irish people with a way to sacralise and make sense of the new world that they themselves were trying to create. John White is writing a doctoral thesis on Knock, nationalism and popular religion at Boston College. C. Rynne, Knock: 1879-1979 (Dublin 1979). M. Walsh, The Apparition at Knock (Tuam 1959). M.F.C. Cusack, The Nun of Kenmare: an autobiography (London 1889). D. Jordan, Land and Popular Politics in Ireland: County Mayo from the Plantation to the Land War (Cambridge 1994).